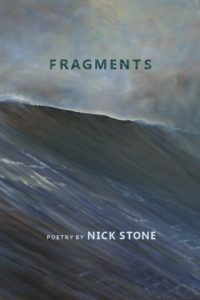 The poems in Fragments are all easily accessible yet equally profound. Each gives the reader new insights into the book’s “simple” subjects of the sea, nature, family and life itself. Each tells a story that ends with Stone’s unique perspective, sometimes witty, sometimes provocative, but always illuminating and truly original. Fragments is a book to read, ponder and then re-read and enjoy differently each time. Nick Stone lives on MacMahan Island, in Georgetown, Maine, where he spent all his childhood summers. After a long career practicing law in Boston, he became a Maine resident ten years ago and now spends his time reviving and exercising the long-neglected right side of his brain through the writing of poetry (and sailing). His poems are all about the sea, family, nature and life.